The new office building of the SAMTAN & SongEun Art and Cultural Foundation will be constructed on the site of the old SongEun ArtStorage site, located in Dosandaero, Chungdam-dong, Seoul. During a press conference held on Oct. 24, Herzog & de Meuron introduced their design plans for the new building. Herzog & de Meuron explained that the new office building, which is scheduled to be completed in June 2021, will be a triangular concrete structure of eleven stories and five basement floors. The design partnership intends to materialise their aesthetic values while allowing for as great a floor area as possible, while also complying with architecture legislation such as the right to sunlight and height restrictions. The façade that faces Dosandaero will have limited windows to view the surroundings, allowing people to get a hint of the direction in which they are headed. In fact, the façade, which resembles an almost windowless bunker, was designed to make the building stand out from others. The neighboring area at the rear of the residential area will have terraces on each floor. From top to bottom the height has been controlled, gradually lowering to alleviate disharmony with the residential neighbourhood. Pedestrian and vehicle entrances will be situated on both sides of the ground floor. The indoor space will house an exhibit space, an office space, and a parking facility. The exhibition space will occupy the second basement floor and the first to third floor, which will be accessible through the first floor lobby. At the back of the first floor there will be a garden following the walls, which will always be open to the public. The office space will occupy six floors beginning on the fourth floor. The exterior of the building is also noteworthy. The plan is that the use wood board cast, that maintains a wooden texture, will add volume to the concrete structure. The patterns and texture of the wooden boards present viewers with a sensual experience and express the meaning of SongEun, which is a hidden pine tree. 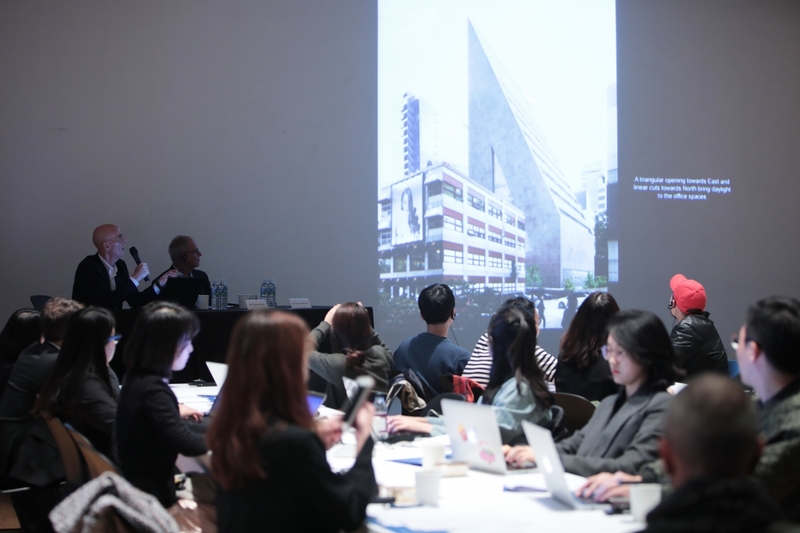 During the Q&A session, Jacques Herzog mentioned that Dosandaero is an area where architectural consistency is hard to find, and that while there are many advanced commercial buildings, there are rarely buildings with uniqueness and genuine quality. He added that this project offered the opportunity for the area to see a high quality building, which will be open to the public, join the neighborhood.